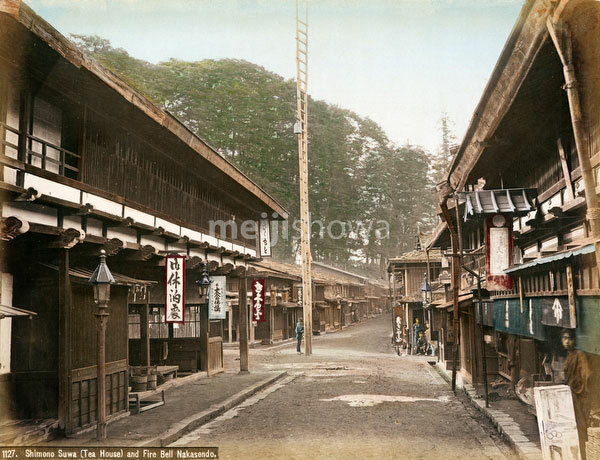 Post town inns (宿場) and a fire bell (半鐘) at Shimonosuwa Juku (下諏訪) in Nagano Prefecture around 1880 (Meiji 13). The town was the twenty-ninth of the sixty-nine shukueki (way stations) of the Nakasendo, one of the two routes that connected Edo (modern-day Tokyo) to Kyoto. Shimonosuwa was an important road connection, being on the crossroads of the Nakasendo and the Koshukaido, and located between two difficult mountain passes, Wada Pass and Shiojiri Pass. In 1843 (Tenpo 14), the town counted 1,345 residents and 315 buildings.